Wheat prices on the Chicago Board of Trade set record highs 23 times in the three months ended October 1 st after weather hurt crops from Canada to Australia. Global reserves will fall to 107 million tons from 123 million tons last year, the U.S. Department of Agriculture said. The tightest world grain stocks in about 30 years are contributing to rising food inflation, fueling worries about food shortages in some countries and straining international aid budgets. Russia recently imposed taxes on barley and grain exports to control domestic food prices before pending presidential elections. India, Yemen, Mexico, Burkina Faso and several other countries have had, or been close to, food riots in the last year, something not seen in decades of low global food commodity prices. 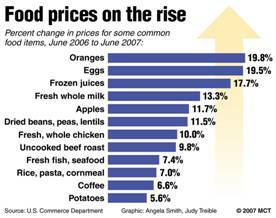 Food prices are likely to stay elevated. Global demand is so strong that record crops are needed just to keep up: World wheat consumption has outpaced production for much of the past decade. Better crops next year will not likely allow for significant rebuilding of the grain stockpile due to increasing demand in surging economies such as China and India, according to an October report by the U.N. Food and Agriculture Organization, which characterized the outlook as "grim." Grain prices, along with higher energy and other costs, are rippling through the agricultural sector. Tight supplies have increased domestic and international demand for alternative feed grains, including barley and sorghum. In the USA, the average price for a loaf of bread is up 11% over the past 12 months. Ground beef has risen 6%, chicken is up 9%, and eggs are up 31%. Overall U.S. food inflation is running 5.6% so far this year, compared with 2.6% for all of 2006. Consumers spend about 10% of take-home pay on food. Food security is not a new concern for countries that have battled political instability, droughts or wars. But for the first time since the early 1970's, when there were global food shortages, it is starting to concern more stable nations as well. “The whole global picture is flagging up signals that we're moving out of a period of abundant food supply into a period in which food is going to be in much shorter supply,” says Henry Fell, chairman of Britain's Commercial Farmers Group. Soaring food and energy prices could trigger political upheaval and riots in developing countries according to experts at the United Nations. Food prices are booming: the Food and Agriculture Organization's food price index in July stood at its highest level since its inception in 1990, and was almost 70 percent higher than in 2000. Record world prices for most staple foods have led to 18% food price inflation in China, 13% in Indonesia and Pakistan, and 10% or more in Latin America, Russia and India, according to the U.N. Food and Agricultural Organization. Wheat has doubled in price, maize is nearly 50% higher than a year ago and rice is 20% more expensive, says the U.N. Next month the U.N. is expected to say that global food reserves are at their lowest in 25 years and that food prices will remain high for years.